When it comes to laundry, the right machinery can make all of the difference. You might have a washing machine that gets your clothing squeaky clean, but do you have an efficient dryer? A lackluster dryer can make laundry duty longer and more challenging. That being said, there’s no better time to replace your appliance than now. Here are some tips and factors to consider as you shop for a new dryer. Once you begin to browse the models on the market, you’ll quickly come to find that your choices can be broken down into two specific types – gas and electric. But which is best for your laundry needs? There are pros and cons to each type of dryer. Electric models can be simpler to install because you only need to worry about finding an open electrical outlet to plug them in and start your laundry. Gas dryers might require the installation of a gas line in your home to suit the needs of your appliance. However, these models typically have a longer shelf life compared to electric dryers, which is something worth considering as you shop. Gas dryers use a fan and natural propane to heat laundry, which can be more costly than electricity, but it requires less drying time – the cost eventually evens out. Electric dryers power a fan that pushes hot air into the machine continuously. They also typically use electricity to power the central chamber and keep clothing in motion for adequate drying. Regardless of which model you choose, the potential for satisfaction exists with both varieties. 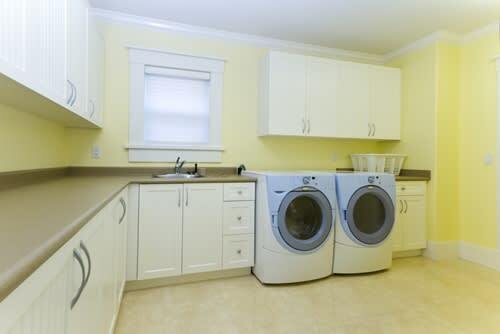 Another obvious factor that you’re going to need to consider is the size of your laundry room. Ideally, you should give yourself enough space to be able to walk by, bend over and load your laundry into the dryer without bumping into anything. Measure accordingly before you begin shopping, then use these numbers as your guideline. In addition to taking your space into consideration, you’ll want to make sure that you have proper ventilation for your dryer once it’s installed. You might need to contact a professional to develop a vent that can allow hot air to escape from the dryer. Doing so can ensure that you’re safely using your appliance on a regular basis. These days, many dryer models come with features such as moisture sensors, which can cut down on drying time and energy usage. Whether you want to go green or you’re looking for a way to save money, investing in one of these appliances can go a long way. Look for the Energy Star rating when you shop to verify the efficiency of a dryer – these models have met government standards that vouch for their environmental friendliness and low energy usage. Condensation dryers are also a great option, especially as part of an all-in-one washer and dryer combination for homeowners looking for space-saving options. Steam drying is another great feature some machines come equipped with. It eliminates wrinkles and can kill dust mites, which helps with allergies. Steam features on dryers have extra installation instructions. Because there are several varieties of dryers on the market, it’s critical to take your time while shopping. However, this buying guide can help you make the right choice and get the most bang for your buck.